We're less a week away from the NFL Honors Award Show in Atlanta, and the race for the 2018 AP Offensive Rookie of the Year is officially down to a two-man race, via FanDuel Sportsbook. It's either going to be Cleveland Browns QB Baker Mayfield or New York Giants RB Saquon Barkley taking home this year's ROY hardware on stage in Atlanta. But right now everything is pointing toward the favorite Mayfield at -125. Both players had fantastic debut seasons, living up to the hype that came from being selected with the No. 1 and No. 2 overall picks in the 2018 NFL Draft. Barkley rushed for 1,307 yards and 11 touchdowns while also hauling in 91 receptions for 721 yards and four touchdowns through the air. He became the first rookie to gain over 2,000 yards from scrimmage. In almost any other season, Barkley would have likely run away with the Rookie of the Year award, but this year he had massive competition from the only player drafted ahead of him. Peyton Manning and Russell Wilson set the rookie passing TD record in 16 starts. 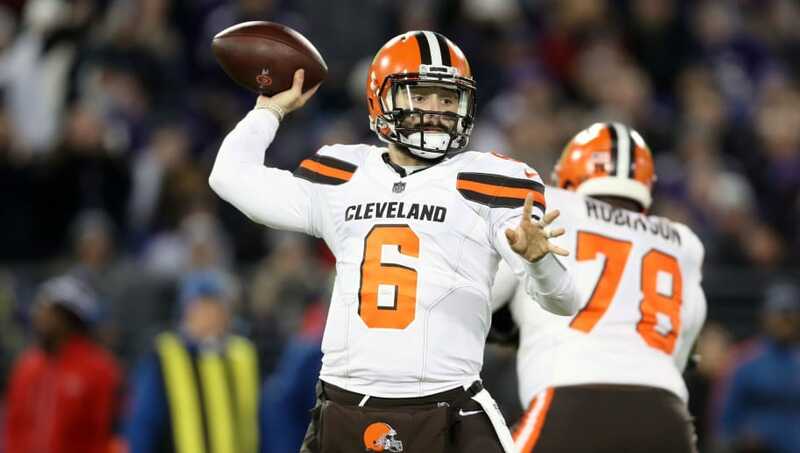 Mayfield threw for 3,725 yards and 27 touchdowns in just 13 starts for the Browns this year. Setting an NFL record is impressive, and doing it in just 13 games is even more so. But, perhaps, his most impressive accolade is reviving an otherwise deceased Browns franchise from the past two seasons of miserable failure. Barkley still has an outside shot, but right now there seem to be more signs are pointing to Baker. Especially after the Pro Football Writers of America named Mayfield their NFL ROY. We'll just have to wait and see who comes out on top this Saturday.